All Things Dog Blog shared rabbit care information and a cute little adoptable lop eared rabbit (my weakness). My House Rabbit joined in with several posts on rabbit care, including enrichment for rabbits and litter training. I Want More Puppies show dogs care about rabbits too! This is their second year joining in and they posted about 2 cute adoptable rabbits- Oreo II and Bella. We even had a duck join in the Hop! George the Duck joined us in promoting the Hop. With so many rabbits in need of homes, it was wonderful having everyone join in spreading the word about rabbit adoption. Thank you! 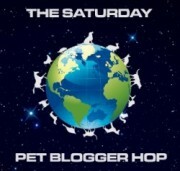 This post is part of the Saturday Pet Blogger Hop. You can find more great pet blogs in the links below!